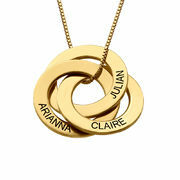 Trendy, fun, and the perfect complement to any outfit, this rose gold Russian ring necklace showcases up to three names or meaningful words on each of its intertwined circles. Made with 18k rose gold plating over 0.925 sterling silver, this stunning necklace includes a matching rose gold-plated box chain. Like more mother necklaces from our collection, this one is also available in your choice of Silver and 18k gold plating and 10K Gold. This item is also available with Two Discs. Beautiful, high quality, and the engravings are flawless. The rose gold is a nice touch, names are engraved nicely. The rings are smooth and even. Wonderful! Awesome job and lovely. 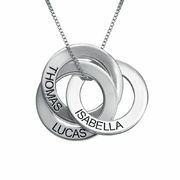 The necklace was great, my wife loved it! 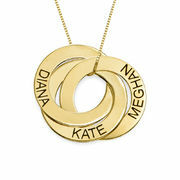 The necklace is nice but it would have been nice to be able to add individual rings if you wanted to. I had to leave off some names because I didn't want to order a whole other necklace. Please offer the rings individually as an add on to your order. I think the necklace is great. Good quality, Good product. I think it's a little bit overpriced.